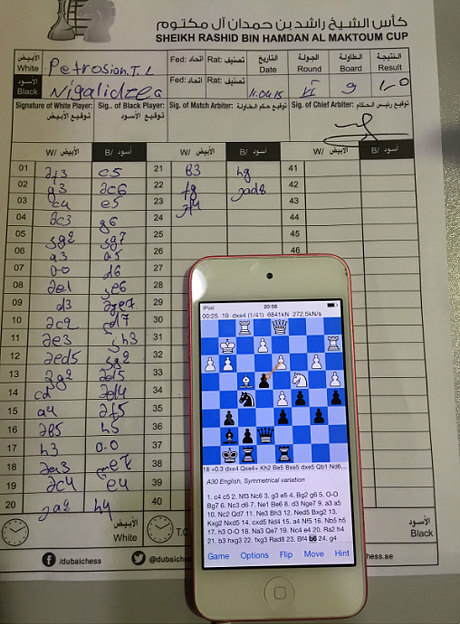 According to a report by The Telegraph, Georgian chess Grandmaster Gaioz Nigalidze was expelled from the Dubai Open after he was caught cheating using a chess application on his iPod touch he had hidden in the toilet. The publication details that his opponent Tigran Petrosian became suspicious about the amount of times he went to the lavatory. Tournament organisers then found Nigalidze had stored an iPod touch in a cubicle, behind the pan and covered in toilet paper. The disgraced chess Grandmaster now faces a 15-year ban from the game. The source notes that Nigalidze’s device was found to be logged into one of his social networking accounts, and had one of his games being analysed by a smartphone chess app. The tournament’s organisers announced their decision to expel Nigalidze on Sunday morning on their Facebook page, saying that “a cheating incident was found during round 6 by Georgian GM Gaioz Nigalidze… bravo to Chief Arbiter Mahdi Abdul Rahim for taking the complaint seriously and raising it to the Tournament Director”. Following Saturday’s match, Armenian Grandmaster Petrosian revealed that “Nigalidze would promptly reply to my moves and then literally run to the toilet”. “I noticed that he would always visit the same toilet partition, which was strange, since two other partitions weren’t occupied. Two years earlier the French chess federation suspended three players, after it was alleged they used mobile text messages and a remote chess computer to cheat.